Dublin, Ireland - Aug. 29, 2017 - Each year, top horses and riders from around the world gather to compete at the esteemed Dublin Horse Show, which was held Aug. 9-13. The historic event always hosts leading athletes, but it is also an opportunity for talented young riders to showcase their skills. E2 Show Jumpers' Katherine Gallagher, Michael Meller and Dan Walsh believe in supporting the efforts of those riders and sponsored the Young Riders division as well as the M. Michael Meller Young Rider Style Award at this year's event. The competition got underway on Wednesday, Aug. 9, when Jenny Rankin piloted Deirdre Bourns' Beech Hill Lucia to a double-clear victory in the 1.35m/1.40m Young Riders class. On Friday, it was Tim Macdonagh riding Tick Tock Tina, owned by Jackie Lee, to the win in the same class. Meanwhile, Olivia Roulston and Keonan Stables Ltd.'s Valent earned the top prize in Friday's 1.25m/1.30m Young Riders competition. The division continued on Saturday, and this time it was Michael Roche riding Seaburg, owned by Fiona Roche, to the top of the leaderboard. In the 1.10m/1.15m Young Riders class, Cian Harrison and Lissyegan Geoffrey, owned by Damien Patrick Griffin, scored the winning honors. The show concluded on Sunday, Aug. 13, with the final 1.10m/1.15m Young Riders class, and it was Mark Finnerty riding Rory Finnerty's Emma leading the lap of honor. 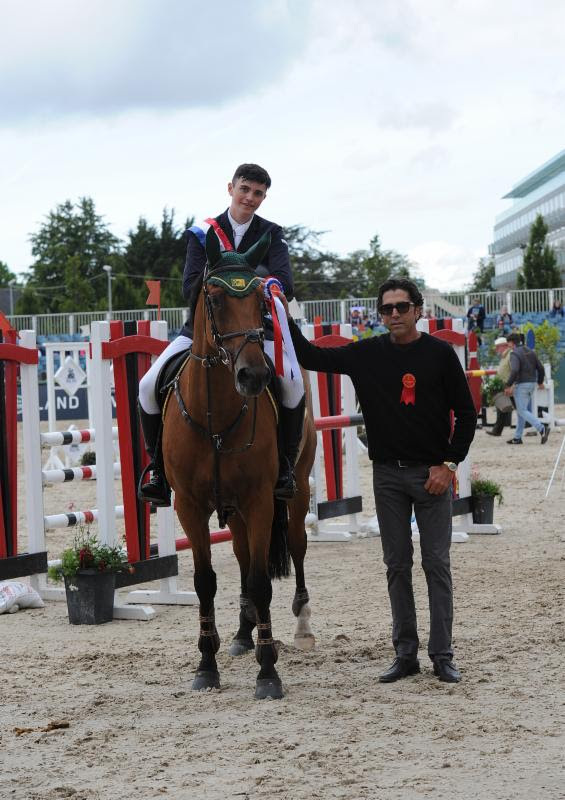 The final award presented was the M. Michael Meller Young Rider Style Award. This year's recipient was Rankin, who won the division's opening competition on Wednesday, while the overall Young Riders (1.10m/1.15m) National Championship, sponsored by E2 Show Jumpers, was presented to Finnerty and Emma. "Jenny had a wonderful feel for her horse in the ring, and she also demonstrated excellent sportsmanship outside of the ring," noted Meller. "She's already been showing successfully in ranking classes throughout Europe. She won the award for her talent but has also exceeded as a role model for these young riders. At E2 Show Jumpers, we strongly believe in supporting the rising stars of our sport. We look forward to seeing Jenny's career continue to progress, and we are thrilled to be a part of the Dublin Horse Show." In addition, E2 Show Jumpers qualified and competed two of their own up-and-coming young horses, Very Chic Du Tillard and Quilimbo, in the prestigious International 7 and 8-Year-Old Championships. Very Chic Du Tillard, an 8-year-old Selle Français gelding (Diamant De Semilly-Jumping Queen 3, Quidam De Revel), was ridden by Dutch rider Doron Kuipers, while Stacy Babes of Great Britain campaigned Quilimbo, an 8-year-old Holsteiner stallion (Quidam De Revel-Soda, Limbus). Founded by Gallagher, Meller and Walsh, the mission of E2 Show Jumpers is to find and produce some of the world's top young show jumping mounts. For more information, please visit www.e2showjumpers.com.